WiTricity has acquired Qualcomm’s Halo technology platform and several patents in contactless power transmission. WiTricity says the acquisition will help accelerate the market introduction of inductive charging for electric vehicles. Great Wall, WiTricity, Meritor, Blockchain. Great Wall does research in Austria: Chinese carmaker Great Wall Motor is about to open its first R&D centre outside of China in the Austrian city of Kottingbrunn. With this step, the company wants to create 100 new jobs and put its focus on the development of powertrains for both, electric and hybrid cars. A few month ago, Great Wall announced its plans to invest a total of 60bn yuan (8,7bn USD) to develop new energy vehicles. Inductive charging tech for Japan: American engineering company WiTricity signed a licensing agreement with Shindengen, allowing the Tokyo-based car supplier to license its patented technology to develop and commercialize high-performance wireless charging systems in Japan. 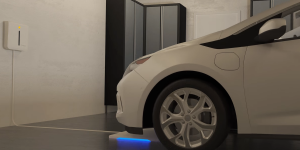 The system enables inductive charging through parking above a charging pad. Ecomobiel 2017 – Ecomobiel has grown to become the biggest platform for sustainable mobility and mobility management in Holland. Take advantage of opportunities like new contacts, cooperations and participation in workshops and debates on different segments. Charging, infrastructure, Smart Mobility and LEV to name just a few. Visit Ecomobiel 2017. Meritor’s electric solution platform: Utility car supplier Meritor says it develops a platform of electric drive axles, suspensions and supporting systems for city-delivery, medium-duty and transit bus as well as off-road and severe-duty applications. The platform shall serve as foundation for various drivetrain configurations, including full electric, hybrid, single or tandem axles. Platform for peer-to-peer energy models: The Prosume Energy Foundation presents a blockchain-based platform to exchange electricity from renewable and fossil sources and promotes its application among others for EV management as well as for data collection and identity management to empower EV rentals with energy barter systems. The company says it is currently negotiating pilot projects in Germany, France, Italy, Sweden, Netherlands, Belgium and Luxembourg. Nissan, WiTricity, Skeleton, Romeo Power, Allison Transmission. Nissan and WiTricity get together but no physically bond may be between them. Their cooperation is about wireless charging, in particular the interoperability of such systems. Maybe the second gen Leaf will already charge without a plug and just leisurely roll over a platform. Graphene Supercapacitor investment in Europe: Skeleton Technologies has borrowed 15m from the European investment bank (EIB). The Estonian company will use the money to fund further research as well as an electrode mass-production facility in German Dresden. Romeo Power to expand: It looks like the EV battery offspring found the factory it wanted in Californian Vernon. With scaling up production, 200 jobs will open. Romeo Power is to expand capacity to 1 GWh in 2017 to 4 GWh in 2018 until ultimately doubling it to 8 GWh by the end of 2019. Hybrid bus system approved: Allison Transmission and Cummins have been certified by CARB. The agency approved the 2017 Allison Hybrid H 40 EP / H 50 EP hybrid propulsion systems paired with Cummins diesel engines used in transit buses and coaches. It is said to save up to 25% fuel. HE3DA, WiTricity, GKN Driveline, Batteryuniversity. Revolutionary nano battery? 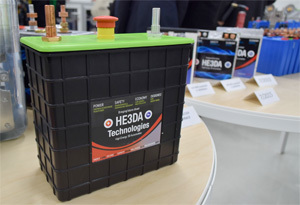 It is eight times cheaper yet more powerful than conventional Li-ion batteries – such is the claim of HE3DA, a Czech company that set up its first production in Prague. 10 MWh of nano batteries that are layered like a sandwich shall be produced there but a new plant is planned in Ostrava with an annual capacity of 250 MWh. Expansion to Europe and the States plus a JV in China is the next step – if the battery truly is as good. GM to test wireless charging at 11 kW: GM teamed up with WiTricity to test the latter’s Drive 11 park and charge system that features 7.7 and 11 kW charge rates. Compliant with SAE standards, WiTricity’s offer spawned licensing agreements with Toyota, Delphi, TDK, IHI and BRUSA. GKN to go electric: 179m dollars will be invested into GKN Driveline’s production centres in North Carolina to gear them up for electric motors mainly. The drivemaker that supplies several OEMs says this will create more than 300 jobs. 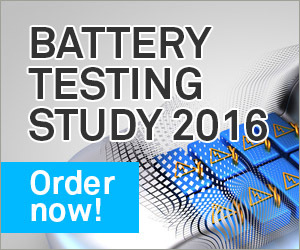 Large battery testing: German Batteryuniversity expanded its testlab and now offers testing of large batteries as used in electric cars or forklifts. Facilities include a shaker as well as a low-pressure chamber, which can also be used to test components headed to space. Apple, John Deere, Lilium Aviation, WiTricity. Apple confirms autonomous car plans: In a letter to U.S. transport regulators, the tech firm for the first time acknowledged that it is working on self-driving technology. It urged the National Highway Traffic Safety Administration (NHTSA) to not introduce too many regulations on the testing of the technology and proposed that companies share data from i.e. crashes to make the autonomous driving even safer. New e-tractor in town: John Deere unveiled a prototype of its new electric tractor SESAM (Sustainable Energy Supply for Agricultural Machinery). The machine features two electric motors with 150 kW each and a 130 kWh battery pack. The tractor is said to require less maintenance and last longer than its diesel equivalent. Cash injection: Skype co-founder Niklas Zennström has invested 100m dollars in Munich-based start-up Lilium. The latter is working on a two-seater electric jet (we reported), ready to take flight by 2018. Range is estimated at 500 km while the jet’s top speed is set at 400 kph. 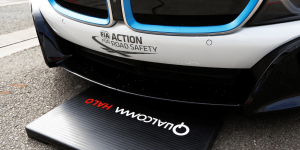 Optimising inductive charging: WiTricity has presented its new Tunable Matching Network (TMN), said to automatically optimise energy transfer between the ground and vehicle using a wireless charging system. It could therefore “correct” real-world operating conditions, such as parking misalignment, different vehicle ground clearance or battery voltage conditions. WiTricity, Lohr Group, Spiri, Chargepoint, Kansas, WestSmart EV. 11 kW wireless charging? WiTricity and Prodrive are working on an inductive charging system for EVs for a “leading European carmaker” who has not been named. The 11 kW system is scheduled for release by 2019. The foundational magnetic resonance intellectual property will come from WiTricity. Electric shuttle: French Lohr Group has prepared to go the last mile electrically as it presented the Le Cristal in Berlin. The compact electric bus seats five but can extend its load by coupling up to four of its kind. Its range was given at 150 km and testing is to commence in Strasbourg next year. Sharing is the motto of Danish start-up Spiri as well, who presented a prototype as planned. The light-weight EV (450 kilos) has been developed by engineers from both Aston Martin and Tesla and shall serve in a new carpooling service. Obviously, the EV is well connected. Waitlist: ChargePoint introduced a new service for EV drivers faced with occupied charging stations. Instead of waiting in front of it, signing up for ‘Waitlist’ enables drivers to be alerted via their mobile phones or RFID card once the charging station becomes available. 1,000 charging stations rejected: Kansas regulators have stopped an initiative by utility Kansas City Power & Light to install 1,000 EV charging stations. The authorities found the plan too expensive but also doubted its environmental benefits and said data was missing. DC charging for 3 states: Rocky Mountain Power has applied for a 4m dollar federal grant to set up an EV fast-charging corridor along the Interstate 15, 80, 84, and 70. If the ‘WestSmart EV’ programme goes through, drivers could traverse Utah, Wyoming, and Idaho. Video tip: Alta Motors is actually a battery manufacturers but they make them for their own super cool electric motocross machines. And while this video is essentially a company introduction and factory tour there is some real dirty action in there too. Jump on in! Reading tip: WiTricity CEO Alex Gruzen took to the keyboard to come up with his vision of a future smart city for Charged EVs. Obviously, his metropolis entails a lot of electric car charging but no wires, and many electric cars but no drivers. Gigafactory, Nissan REx, WiTricity, 24 Technologies. Gigafactory to start cell production: Tesla plans to complete the installation of battery cell manufacturing equipment by July 20, so production could start as soon as the Gigafactory opens at the end of July. Furthermore, a fifth section is in the making in Nevada and valued at 63m dollars. Rumours that Tesla is building a similar factory in China however, have now been denied by Elon Musk. Nissan REx by 2017: The Japanese firm readies its range extender technology to debut in a new PHEV for Japan next March. First presented in the Gripz concept last year, the e-Power generates 80 kW. It is unclear if the REx will become available outside Nippon and it is also unlikely to feature in the Leaf. 25 kW inductively: WiTricity is scaling up ever higher without wire as the company introduces an 11 kW wireless charging system with the ability to scale to 25 kW and more. A 7.7 kW version that was developed with Nissan has been tested and validated. Efficiency is given at up to 94 percent. Scaling up as well is 24M Technologies that has been awarded 7m dollars by the U.S. Advanced Battery Consortium and the DoE to come up with a manufacturing process for its novel cell design. 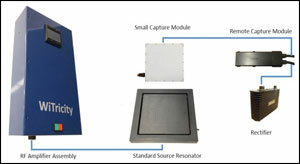 The A123 spin-off has 36 months to show how to scale its prismatic Li-ion cells to mass production. Airbus, Siemens, WiTricity, Volvo, fuel cell. Hybrid propulsion system: Airbus and Siemens have signed an agreement to jointly develop hybrid-electric drives for airplanes. Until 2020, the partners want to show the feasibility of various propulsion systems. Airbus CEO Tom Enders is convinced that an airplane with less than 100 seats could be propelled by a hybrid system by 2030. Inductive charging technology: WiTricity has signed another license agreement, this time with Japanese company Daihen. The latter will use WiTricity’s magnetic resonance technology for its inductive charging technology for forklifts and Automatic Guided Vehicles (AVG). Generator highway: Volvo has fitted a short bit of highly frequented U.S. road with an underground hydraulic generator. Every passing vehicles generates electricity, used to charge a nearby parked Volvo XC90 Plug-In Hybrid. The PHEV thanked (perplexed) drivers on a giant screen and left the charger with a full battery later that day. Fuel cells from South Africa: As part of a project to build up local skills in hydrogen and FC development in South Africa, company Impala Platinum Limited unveiled a new fuel cell powered forklift and H2 fuelling station. It was developed by Hydrogen South Africa (HySa) Systems, the University of the Western Cape (UWC) and the Department of Science and Technology. Most clicked link on Thursday was France’s environmental minister offering Tesla to set up a production plant in an old nuclear facility. Brusa, Witricity, Electrovaya, Evonik Litarion, Taxi 2000, Toyota. Inductive charging connected: WiTricity announced an intellectual property licensing agreement with Brusa. The Swiss company will commercialise WiTricity’s technology for its ICS wireless charging system. 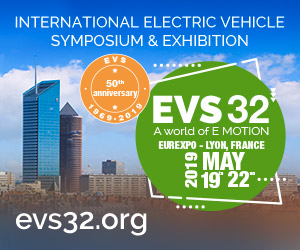 Both companies are cooperating with a number of international standards organisations on the interoperability of inductive charging systems worldwide. Evonik acquisition: Canadian Electrovaya has bought Evonik Litarion, a subsidiary of German Evonik. The acquisition includes the licensing of the ceramic composite separator Separion from Evonik, as well as a modern production plant for Li-ion electrodes and ceramic composite separators. EVs in the sky with no drivers: Taxi 2000 is to modernise transport in Greenville, South Carolina. The Skyweb Express uses electric and autonomous vehicles running on elevated guide ways at between 30 and 70 mph. The company is now asking the public for its opinion. Mirai technology reloaded: At the SAE World Congress, Toyota gave price technical details about the fuel cell stack and hydrogen storage system of its fuel cell vehicle. The Japanese carmaker made the respective patents publicly available earlier this year (we reported). Tesla, ZTE, WiTricity & CTEK, Nissan. Tesla battery for the home: Tesla´s plans to not only power cars but also households seems to become more concrete. CEO Elon Musk said that the design for the in-home battery has been completed and that production could be launched in the coming six months. More technical details were not released. Inductive deals, take 1: Chinese smartphone manufacturer ZTE wants to invest some 3.5 billion yuan (560 million dollars) in inductive charging technologies until 2016. Apparently, deals with over 20 Chinese cities to provide the technology for public transportation have already been made. According to its own accounts, ZTE is also in talks with several carmakers over possible collaborations. Inductive deals, take 2: CTEK, a Swedish supplier of battery charging systems, announced a technology and patent license agreement with WiTricity, for the commercialisation of the latter’s inductive charging technology. CTEK plans to develop wireless charging systems for i.e. the automobile industry. Evening eye catcher: A newly introduced ‘ultraviolet-energised paint’ lets the Nissan Leaf glow in the dark. During the day, the paint absorbs UV energy from the sun and gives off an eerie glow at night. And that’s not all: At the Chicago Auto Show, the carmaker presented a Leaf with a ’self-cleaning’ paint. Most clicked link on Thursday was the e-Golf review by Jonathon Ramsey. Reading tip 1: Philip E. Ross looks on WiTricity, that licenses its wireless power technology to car companies and automotive suppliers, which develop it for the market. According to the company, its system can funnel about 90 percent of the input energy into a car’s battery. Reading tip 2: AutoWeek tested electric at the Michelin Challenge Bibendum, including a Denza, the e-scooter Super Yadea New Bike and foldable electric scooter Bud-e. The one thing they did not get to drive was an electrified Chang with a supposed range of 621 miles – too dangerous, engineers said. WiTricity, Hydrogen South Africa, Hyundai. WiTricity to charge faster: The inductive charging specialist is working on stronger solutions. The company announced to now have a 6.6 kW system apart from the usual 3.3 kW charger. Furthermore, Witricity wants to add even more power and speaks of “10s of kilowatts” to be added in the future. Fuel cells on airplanes could soon replace the auxiliary power units (APUs) currently powered by small gas turbine engines. In a three-year project funded by Airbus and South Africa’s National Aerospace Centre, Hydrogen South Africa (HySA) will research into that matter. New Hyundai ix35 spied: Photographers caught the camouflaged ix35 while testing. The Hyundai will only be fully unveiled at the end of 2015 but will then be offered shortly after as fuel cell vehicle again. No major changes are expected for the model year 2016. Most clicked link on Tuesday was the video of the inglorious attempt to fit two women’s luggage into the designated compartment of a Porsche 918 Spyder. BYD unveils Tang: The Chinese manufacturer has officially unveiled its latest plug-in SUV in Beijing. The Tang comes as 4WD and is said to drive about 40 miles all electrically. 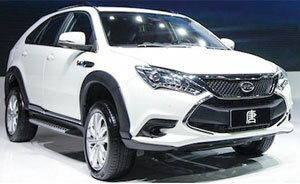 Furthermore, BYD revealed plans to offer a new ‘super-hybrid’ called Ming featuring four in-wheel drives by 2016. Wireless charging commercialised: WiTricity is licensing its inductive charging technology to the Japanese TDK Corporation. The licensing agreement will enable TDK to market WiTricity’s wireless charging technology for EVs on a large scale. Small secret: The Vivax Assist conversion kit for pedelecs is inserted into the seat post and can provide a boost of up to 200 W. Its battery sits in a saddle bag. The system is so inconspicuous that once a cyclist at the Tour de France was suspected to have used it secretly. Fuel saving PSV: Hayvard has been commissioned by Fafnir Offshore HF to design and build a hybrid Platform Supply Vessel (PSV) together with Norwegian Electric Systems. Ironically, the boat is supposed to serve around offshore oil platforms in the Arctic while saving 30 to 40% of fuel itself.